When attending indoor exhibitions, basic shell scheme booths (which usually just include walls, floor and lighting) need not mean a basic look. Customising the space to stand out from other booths is key to creating a lasting impact. 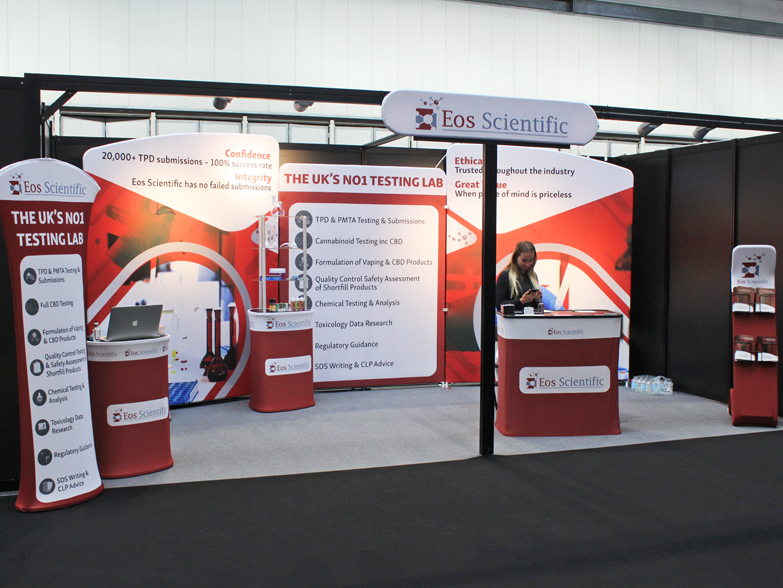 Eos Scientific came to Instant Promotion UK looking for just that when they attended the NEC Vape Show 2018. They chose one of our fantastic 3x6m Tension Fabric Booth packages, offering easy to assemble products complete with exceptionally high quality, vibrant print. These booths are extremely versatile, as the panels can be separated or even turned 90 degrees. 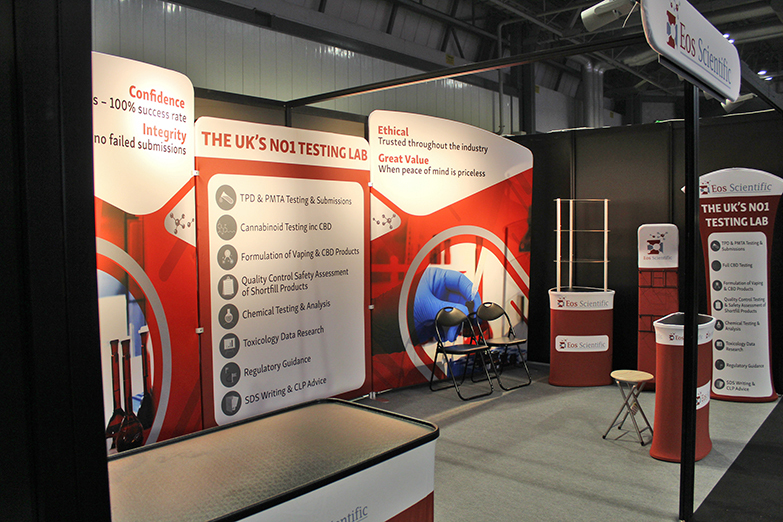 We also offer a huge amount of fabric counters/table stands/podiums to complement any booth package. 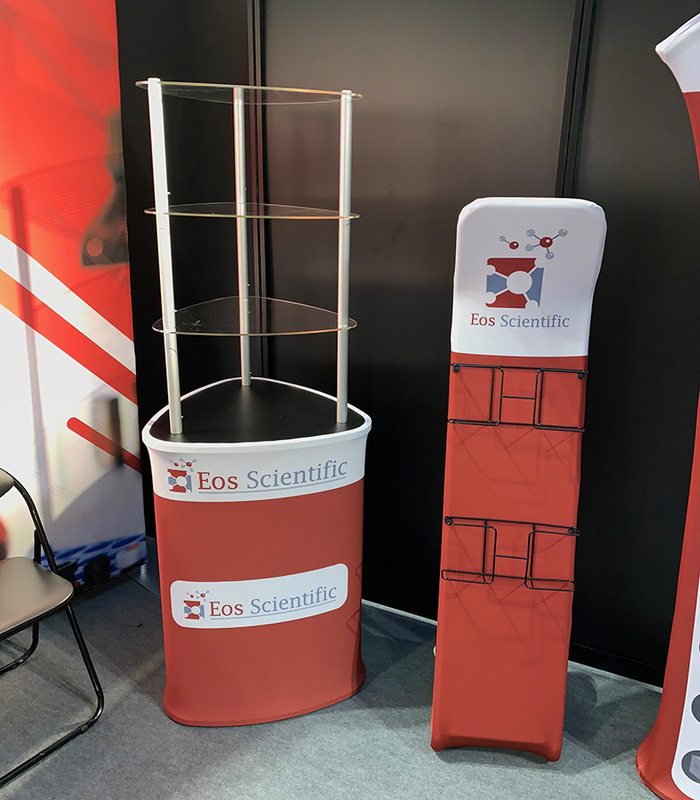 Eos Scientific’s booth included 6m x 3m Stretch Fabric Backdrop, Stretch Fabric Podium, Pop-Up Counter, Display Unit, Display Tower with shelves, A4 Brochure Stand. The fabric graphics have the added benefit of being washable and can be easily replaced for cost effective rebranding. To find out more about the Exhibition Stand Packages we offer click here.